This snapshot has only just come to light this year, kindly sent in by Neil Thorp of the SAHB. It is his late father-in-law’s “Buggy” which he used in Tel Aviv during the second world war. Neil has identified it as an American Bantam Roadster Series 60 which was produced in 1938, with only 512 of that model being made. What is intriguing is how such a car came to be in Palestine in the first place as it was thought that they were manufactured solely for the US market. It is not, in Neil’s opinion, a car that would have been chosen by the armed forces, so it would more likely have been a personal import before hostilities broke out, but maybe others more knowledgeable could comment. The owner was Captain Frank King. He was a professional soldier in the Royal Engineers at the time and, like so many others, had a knack for “acquiring” useful things! The story of the American Bantam starts in 1929 with the American Austin Car Company in Butler, Pennsylvania. The company’s intention was to assemble and sell in the USA a version of the Austin 7, to attract small-car enthusiasts in the USA. The cars had 747 cc inline-four engines, enabling the car to travel at 50 mph. Styling resembled small Chevrolets, with Stutz- and Marmon-style horizontal hood louvres. The bodies were designed by Alexis de Sakhnoffsky and made by the Hayes Body Company of Detroit. The Great Depression made cheaper secondhand cars more appealing, so sales dropped off, and in 1934 the company filed for bankruptcy. In 1935, Roy Evans, a former salesman for Austin, bought out the bankrupt company and reorganised it under the name of American Bantam. He made a series of changes to the American Austin car design, including a modified engine, and exterior sheet metal once again designed by Alexis de Sakhnoffsky. Production resumed in 1937, and continued up to 1941. Despite a wide range of Bantam body styles, ranging from light trucks to woodie station wagons, only about 6,000 Bantams of all types were produced. The American Bantam roadster is said to be the inspiration for Donald Duck’s car, which was first seen in the cartoon Don Donald (1937) – but the distinctive radiator shell of the Bantam, with its pointed prow and horizontal bars, doesn’t appear in the film – the front is much simpler. A 1937 Bantam brochure does, however show that the side view of the Bantam is very similar to Donald Duck’s car. The Model 60, it seems, did not arrive until 1938. Product placement, but to attract duck buyers? This is a great photo! 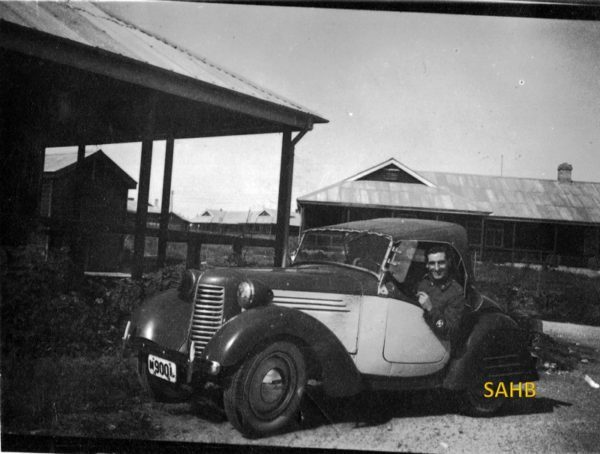 Do you have any other photos or information on this car? There was actually a Bantam dealer in Israel, I have an original advertisement someplace for 38 roadsters entirely in Hebrew.